You can learn a lot about modern computers by studying one from the days of disco! 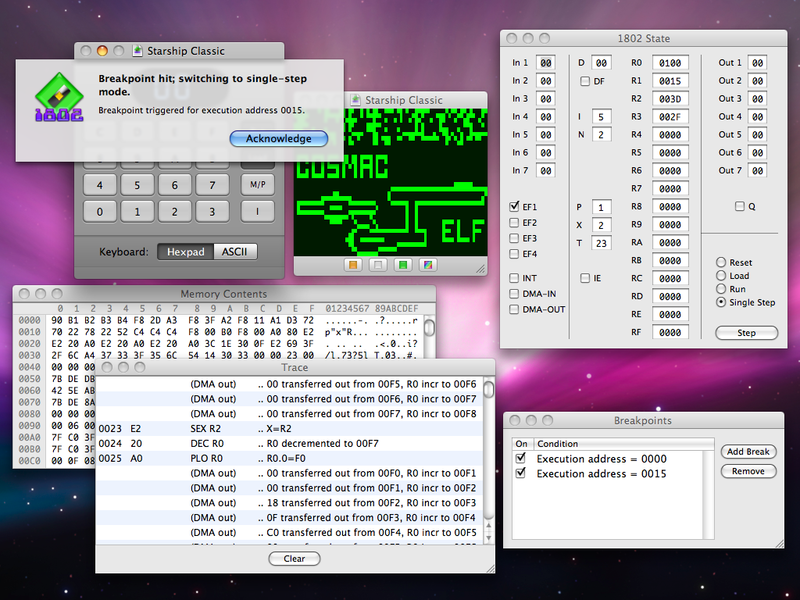 TinyELF for Mac OS X brings emulation of 1802-based microcomputers to the Macintosh platform, and runs on OS X 10.4 (Tiger) or greater. TinyELF features pixie graphics, single-step debugging, a CPU state viewer, program execution trace, breakpoints and more. Its help book includes a full tutorial on computer fundamentals and programming. June 21, 2009 - Plans for an iPhone version of TinyELF are on hold indefinitely, because of this rejection of a Commodore 64 emulator. Some commentary I've read about this suggests that Apple is merely trying to prevent apps that can execute arbitrary, malicious code, but anyone familiar with emulators knows that they play inside their own little sandbox. While evildoers could certainly craft something that deliberately stepped outside that sandbox, it's no more a concern than with any other app that interprets user data or data from the internet --- which covers pretty much everything. Apple's reviewers should know that; the existence of some other emulators in the App Store even hints that a few might, but app acceptance shouldn't be a crapshoot. The only real gripe Apple could have here is if there's a potential to sell content that bypassed the App Store and its revenue stream --- but I own a Bible app from Olive Tree that does that, too, so go figure. May 12, 2009 - Okay, so not much has changed for TinyELF in the last year and a half. Has it been abandoned? Nope; it's just not a money-maker, so development just takes a back seat to projects that actually pay the bills. I'm still fond of it, however, and I expect that there may be news later this year when Snow Leopard is released. 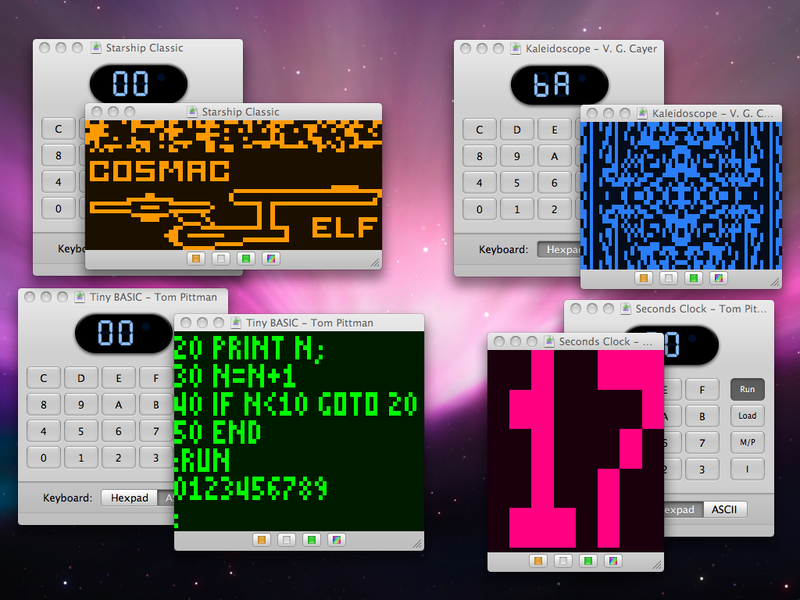 I'm also hoping to put out an iPhone version when another (top secret) project wraps up. October 27, 2007 - Leopard is out, and so far TinyELF seems to get along just fine with the new cat. It looks a little different, of course, since the brushed metal has been replaced by the new "unified" appearance, but that's good: it blends in with the rest of OS X, which is just what we want from Cocoa apps. I like the buttons better, too: it's much easier to see when the Run button is down, for instance. If you do happen to see Leopard gag on TinyELF, please let me know. August 30, 2007 - A nice fellow named Neal Granroth sent me the following email: "Just had to say 'well done' on the TinyElf application. The 1802 is an old friend, like many others I built one many years ago; a home-brew version similar to the Popular Electronics article, and learned a lot about assembly and digital electronics in the process. When I happened across a reference to TinyElf a few weeks ago I had to try it out with some of my old programs and some more recent that I'd created to amuse the kids (they have a very hard time comprehending that my ELF can do anything with no CD, no floppy, no harddisk, no USB, and only 1024 bytes of RAM!). If you'd like a few more examples to add to your programming examples, here are a couple favorites of mine that I've modified so they work with TinyElf." Download the ZIP file Neal included here. Fun stuff; thanks, Neal! February 6, 2006 - Sorry, Intel users. It seems I missed a byte-order dependency that keeps TinyELF from running correctly on Intel-based Macs. I think I've got it fixed, but I'm going to borrow an Intel-based Mac to verify it before releasing another version --- so stay tuned. PowerPC-based Macs will run the current version of TinyELF just fine. January 31, 2006 - This is the sort of thing that makes freeware worthwhile: check out Marco Iapicca's site, where he's resurrecting some "Pong era" games on the Windows platform, and probably having a lot of fun in the process. Browse the screen shots for Mousetrap and you'll notice a bit of inspiration from TinyELF. January 30, 2006 - For the benefit of those who haven't upgraded to OS X 10.4, the older 1.3 release of TinyELF is still available here. January 8, 2006 - TinyELF 1.4 adds support for Intel processors --- in theory. I don't have an Intel Mac to test this on, so it should be considered somewhat experimental at this point. To keep things simple (hey, it's freeware, after all), I've also linked against the OS X 10.4 libraries, making OS X 10.4 the new minimum platform for running TinyELF. If you're running OS X 10.3 (a.k.a. Panther), do not upgrade your version of TinyELF. June 13, 2005 - TinyELF will soon be built as a universal binary --- a program capable of running without speed penalties on both PowerPC and Intel processors, for the next generation of Macs. TinyELF is built entirely with XCode in Objective-C and uses Apple's Cocoa framework, so the move to Intel processors won't be a big deal. June 4, 2005 - Version 1.3 released to fix a cosmetic problem with Tiger. February 25, 2005 - Anyone with an interest in having abandoned software become legally available should visit orphanworks.org and submit comments to the U.S. Copyright Office by March 25th, 2005. Thanks to the Electronic Frontier Foundation for the alert! December 23, 2004 - Version 1.2 released with a few minor fixes. Thanks to Marco Iapicca for discovering the idle bug! November 8, 2004 - Any curious party with a browser can now browse TinyELF's help online using the View Help Online link in the navigation bar on the right. November 7, 2004 - Version 1.1 released with audio simulation and Intel hex file support. See the version notes for complete details. May 14, 2004 - Version 1.0 now ready for download, with a full help system that integrates Tom Pittman's Short Course and numerous small improvements. April 26, 2004 - A few more small fixes and additions for version 0.3, available now. Details are in the version notes. Thanks to Richard Peters for helping find this odd short branch bug! April 23, 2004 - Several small user interface tweaks have been made; see the version notes for full details. You can now download version 0.2. April 21, 2004 - Time to get some fresh eyes on this project. Version 0.1 is now available for download, but for the time being will only be announced on the discussion group. Let the bug hunt begin!